In less than two months, the FC and I will be renovating the new coachouse. It’s exciting and confusing as this perfectionist Libra ponders the endless options. Tiles and countertops and flooring, oh my! Nailing the kitchen layout will be key. It’s a narrow space so we’ll have to keep things efficient and streamlined. 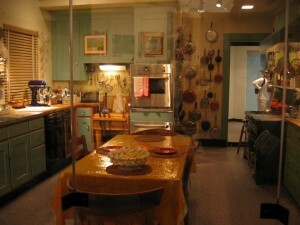 For inspiration, I looked up Julie Child’s Paris kitchen. (Pictured above.) See the peg board on the wall in the background? It’s like a garage or carpenter’s workshop, so masculine and practical. But unless we tear down walls, we have much less space to work with. I also want something more modern and fun. (Ms Child’s kitchen is on the dowdy side or is that sacreligious to say?) The FC hopes we can track down some interesting secondhand cupboards — he likes to keep things vintage (ie, cheap) when possible. And I don’t disagree. This entry was posted on Tuesday, January 19th, 2010 at 5:02 pm	and is filed under Uncategorized. You can follow any responses to this entry through the RSS 2.0 feed. You can leave a response, or trackback from your own site. oh.. i wonder if those old cupboards found a new home just a few months shy of your own necessity!? anyway.. out with the old old, in with the new old. Thanks for the references Margo. Keep ‘em coming.